Meanwhile make cilantro-lemon salsa verde. In a bowl mix together finely chopped cilantro, olive oil, lemon zest, lemon juice and garlic. Season with salt, pepper and additional lime juice, if desired. Skewer the shrimp on wooden skewers and brush with olive oil and season with salt and pepper. Grill shrimp skewers, 3 minutes per side or until shrimp is opaque. Place cooked shrimp on platter and cover loosely with foil while you grill remaining shrimp. 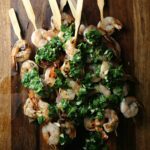 When ready to serve drizzle shrimp with lemon-cilantro salsa verde.